Don't mess with Sky Shadow -- he's one of the most foul, dark-hearted Decepticons in the galaxy. He takes no prisoners and always finds his target. Even the evil Megatron shudders when he hears the whine of jet engines in the distance, for it may be Sky Shadow coming for him! Well, that's the worst toy bio I've ever seen. Since it tells you absolutely nothing about the character, here's a quick rundown. 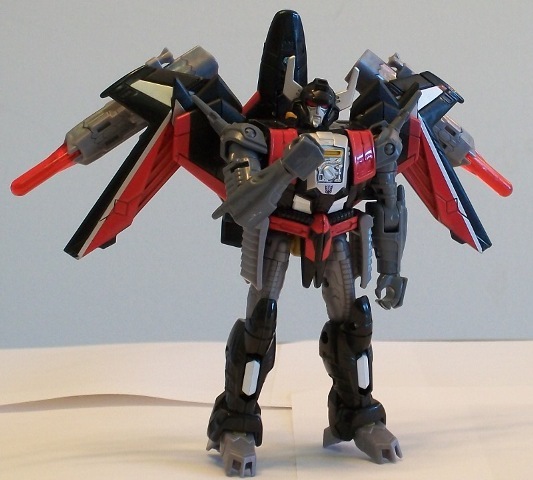 Sky Shadow is a remold of Generations Thunderwing, and is based on Thunderwing's original 1980s Japanese counterpart, Black Shadow. Like Stepper, Artfire and Minerva, Black Shadow has a bit of a cult following in the west on account of being an obscure Japanese character and a redeco of a popular Western character in Thunderwing. His only substantial media appearance to date came in the Japanese Victory anime, where he and fellow Crossformer Blue Bacchus were gangsters hired by Breastforce to steal Energon from a planet of Micromasters. They failed, naturally, and were never seen again. No one actually cares about this, though, and Black Shadow's fandom notoriety is almost entirely due to the fact that his tech spec function was mistranslated by fans into the hilariously Futuramaesque "Space Mafia". As an obscure nobody, Black Shadow isn't the first character you'd think of when you're naming characters likely to be revisited in a nostalgia line like Generations. But once a new mold for Thunderwing was designed, a redeco into Black Shadow was almost inevitable because Hasbro like to reuse every mold they design at least once. It was a pleasant surprise to see that they went beyond the typical redeco, though, giving Sky Shadow a new head and chest based on Black Shadow's anime character model. It's a nice touch, especially for an obscure character, but is it enough to surpass the thoroughly mediocre Thunderwing? For my part, I didn't really care -- I bought the toy solely because he's an important character in the Archive's RPG. But I suspect that's not reason enough for most of you. Alternate Mode: Although the original mold was a generic alien jet, Sky Shadow is an undeniably earthly machine that cribs a lot of design elements from the F-22 Raptor. It's a nice, vaguely futuristic design that maintains a lot of the original toy's most recognizable features, including canted-forward wings and a nosecone that detaches to form a separate mini-jet. Unfortunately, Sky Shadow's more vivid colours make the design look very, very busy compared to the more sedate Thunderwing. He's a riotous mix of red, silver, grey and gold on a mainly black fuselage, and walks a very fine line between awesome and tacky. Which side of the line he falls on is going to be strictly a matter of taste. His arms and legs are both clearly visible in jet mode, although the preponderance of grey and black on the limbs make the effect a fair bit more subtle than with Thunderwing. He's still very obviously a robot that's been folded up under a plane, though. He also has one flaw that Thunderwing didn't. His new head is quite a bit larger than Thunderwing's, meaning that it won't fit properly in the little cubby that flipped up to hide the head on the original iteration of this mold. In particular, Sky Shadow's giant anime ears stick out quite prominently just below his air intakes, changing the look of the jet's front end. Just like the original, Sky Shadow is bristling with weapons. Spring-loaded missile launchers hang off each of his wings, with two smaller, non-firing missiles molded onto each of them that can double as mounting points for 3mm C-clip weapons. He also sports a pair of jointed cannons mounted on...well, on the obvious robot-mode shoulders under his wings, and a pair of what look like machine gun ports molded into the nose of his detachable nosecone jet. He definitely looks like a threat. The detachable nose is a nice touch, a throwback to the original toy which was a Mega PretenderCrossformer with a small, transforming robot and a large transforming shell. Sky Shadow's mini-jet doesn't transform, obviously, but being able to split him in two adds a lot to his play value in jet mode. Honestly, I'd love it if more Transformers had features like this because far too many of them turn into vehicles that don't really do anything. Sky Shadow may not be a very convincing jet, but he's fun to fiddle around with and that's important too. 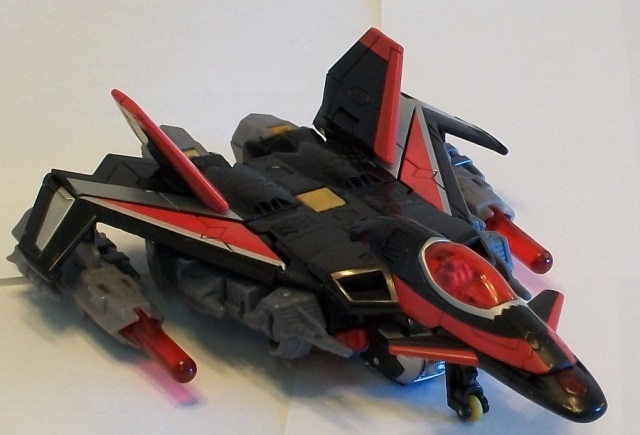 Robot Mode: Sky Shadow is, honestly, not all that impressive at first glance. He's short, squat and doesn't have the best colour scheme. His chest, shins and wings are black with red, silver, white and gold highlights. That's not the problem...looks really good, actually. Unfortunately, his thighs and arms are molded in a bland dark grey with no paint apps at all. Not only does it look bad in it's own right, it's actually a divergence from Black Shadow's original colours -- which featured white biceps and silver thighs that broke up the grey nicely. It's a really odd mix of detailed paintwork with big completely undetailed chunks, and a big disappointment because it could easily be so much better. Beyond the obvious colour scheme differences, Sky Shadow manages to stand out quite a bit from Thunderwing. The new chest and especially the new head make a big difference. Thunderwing's head was a bit on the small side, but Sky Shadow's is on the other side of the spectrum. It's fairly big, and the giant ears make it seem even bigger. It's just enough to change the silhouette of the figure and make him look different from his mold-brother. It also looks really nice, albeit a bit generic. If Sky Shadow was easier to find, it would be a great head to use for any number of kitbash projects. 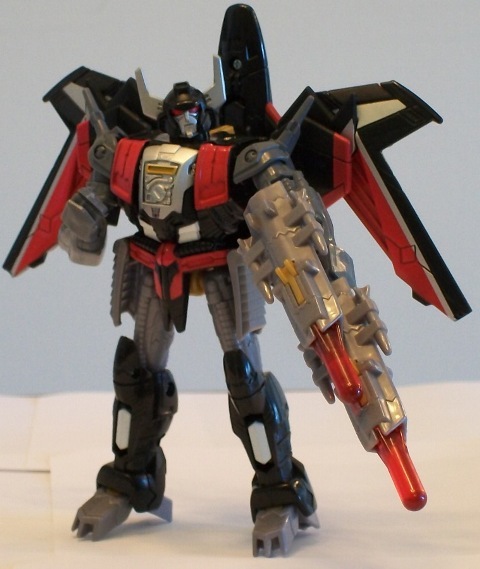 To further differentiate the two of them I also tend to pose Sky Shadow with his wings split open and his missile-launchers still attached, which has the unintended side effect of further underscoring his origin as a minor character in a ridiculous Japanese anime. The wide wingspan that results from it also compensates a bit for his short stature, making him look a bit more impressive than if he was carrying the missile launchers in his hands with the wings folded up (though obviously, that works just fine if you want him to be more conventionally armed). In terms of articulation, Sky Shadow is fairly standard. With ball-jointed hips and shoulders, mid-thigh and bicep swivels, hinged knees and elbows and wrist swivels, along with a ball-jointed neck, he's certainly got lots of joints to fiddle with. Unfortunately, "fiddle" is about the best you can do with him. His shoulder movement is seriously hobbled by the cannons mounted on them, because they get blocked by his wings and prevent the arms from being raised more than a few degrees. Likewise, the ball joint on his head is seated so deep that for all intents and purposes it might as well be a simple swivel. His legs are the only parts that have unrestricted movement, and he's got good balance, but in terms of poseability he's below par. Honestly, there's not all that much to say about Sky Shadow. He's not bad, but by modern standards he's a very, very simple toy.